WordPress Pokhara August Meetup 2018 is Tomorrow! The WordPress Pokhara community has announced a local meetup to be held for the month of August – WordPress Pokhara August Meetup 2018. The meetup will be held tomorrow, on 31st August 2018 at Unistar Education in Siddhartha Chowk, Pokhara. The meetup will kick off at sharp 5 P.M. and will last till 6 P.M. The presenter for this meetup is Mr.Yamu Poudel. Yamu Poudel is the Chairman/ Dev Ops Chief at Hello World Corp, one of the growing IT Company in Nepal. The topic for WordPress Pokhara August Meetup 2018 is “Development Database Deployment and Security”. 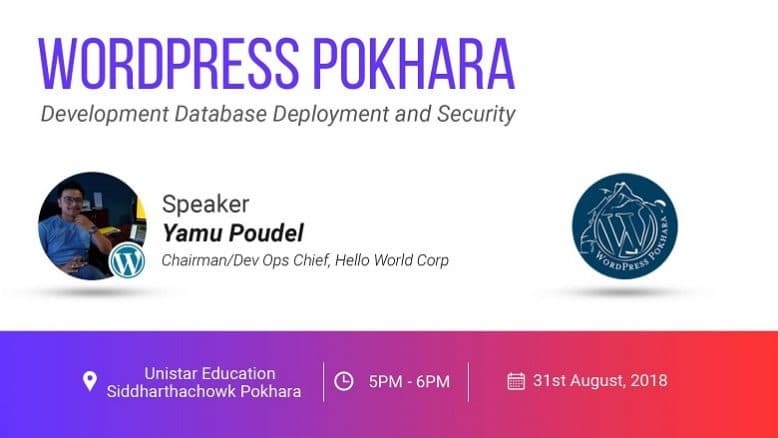 Yamu Poudel will be presenting his talk on the mentioned topic and those who want to learn Database Deployment development and about its security issues can attend this meetup. WordPress Pokhara August Meetup 2018 is an open program and welcomes every WordPress enthusiasts. The entry to this meetup is completely free. Also, you will get a chance to meet the speakers and other WordPressers during the networking session which will take place after the meetup. For more details, check out the official event page on Facebook. And, you can also follow the official Facebook group of WordPress Pokhara to keep up with the latest news and events regarding WordPress.